In part 2 (Part 2 – Apple OSX MP -The compiling and installing of the OMI agent on your Mac) we got the OMI agent running on our Apple Mac and were able to query it with the OMI client. No we will go one step further and do some cross-platform querying with Powershell. First of all make sure you are running at lease Powershell version 3.0. 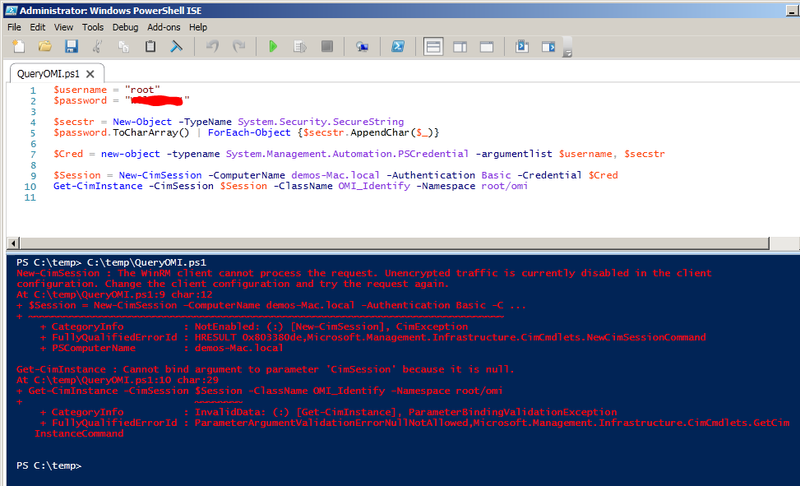 Earlier versions of Powershell do not contain the Get-CimInstance commandlet which we need to query OMI. We also need to make sure we can resolve our Mac by FQDN. In my test lab I just added the my Mac to the hosts file so that I can resolve and ping demos-mac.local. Personally I like to use the Poweshell ISE that comes standard with Windows, so I plugged the code into the code Window and hit run. 1. Allow encrypted traffic from the Windows Computer from which we are running the Powershell Script. 2. 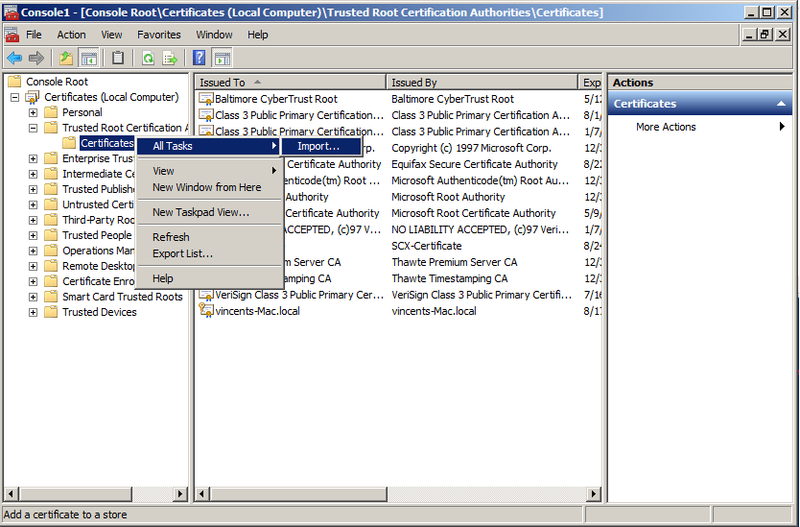 Import the certificates generated by the OMI Agent. 3. Generate your own certificates. In this blog I will go for the second option, and import the Certificates generated by the OMI agent. To import the certificates from the OMI agents we need to convert and export them from the machine on which the OMI agent is installed. After executing the previous command you should have a new omikey.p12 file. 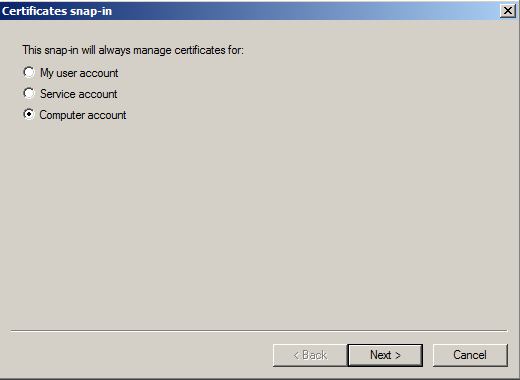 On the Windows machine open a certificate mmc snapin which displays the certificates for the computer account. Import the omikey.p12 into the Trusted Root Certification Authoroties. Awsome! We just connected to our Mac using WinRM! 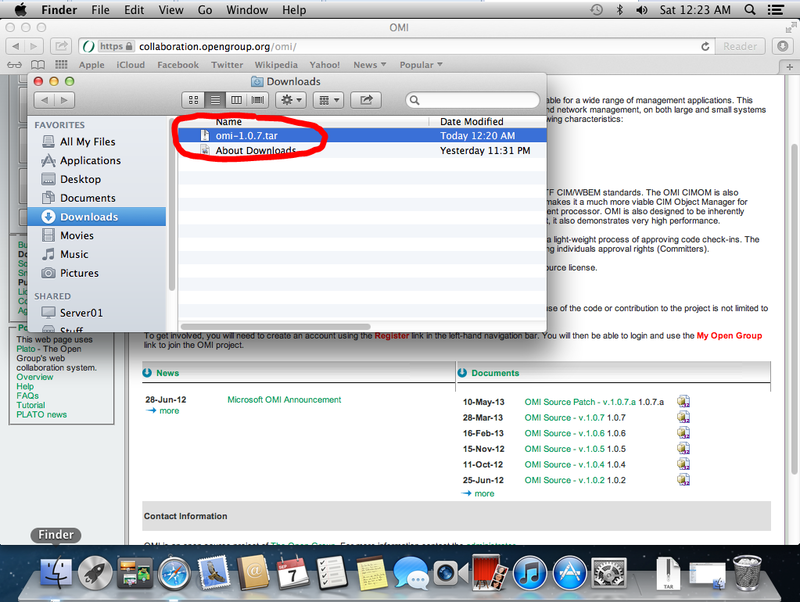 If you downloaded the OMI Package on your MAC, double click the package to unzip the archive. If you are using Windows, you will need something like 7zip (freely available) to unzip the archive. I unzipped my archive and saved it to Document/omi-1.0.7, but you can choose your own directory. Before we can compile OMI we need to download compile and install the package pkg-config. Pkg-config is used by the OMI package for configuration so we need to satisfy this dependency. The latest pkg-config source can be downloaded here. I have found that some of the newer versions of the pkg-config package do not compile well on a Mac so I use the pkg-config-0.18.1.tar.gz which should also work for you. 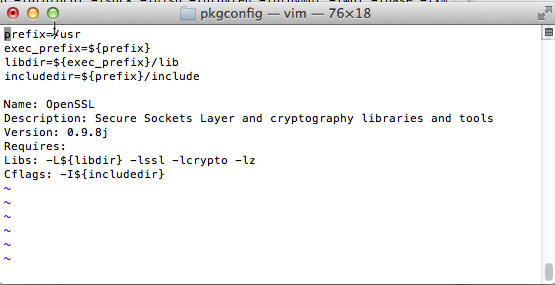 After downloading the package I unzipped the archive and saved it to Documents/pkg-config-0.18.1. 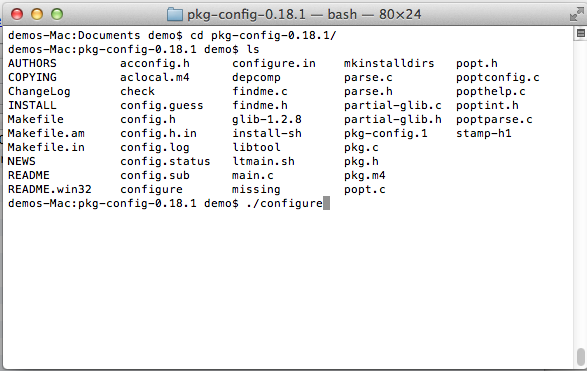 Now open a terminal window (open a finder window and click Applications -> Utilities -> Terminal) and cd into the pkg-config-0.18.1 directory. Once in the directory issue the ./configure command at the command prompt. If there are no errors creating the configuration, issue the make command. Now if there are no errors, issue the sudo make install command. This will prompt you for an admin password because it wants to install the compiled files. # The configuration of omi is generated by the omi installer. Note that after issuing the ./configure command you will receive the error “pam script is not supported on Mac-OS yet“. You can safely ignore this error because already we registered the PAM modules manually. So woohoo! Our OMI server is running on our Mac and accessible by a client. In part 3 of this blog we will explore how to query the OMI server by using Powershell. The first thing we need to do is getting our Apple Mac ready for compiling OMI. 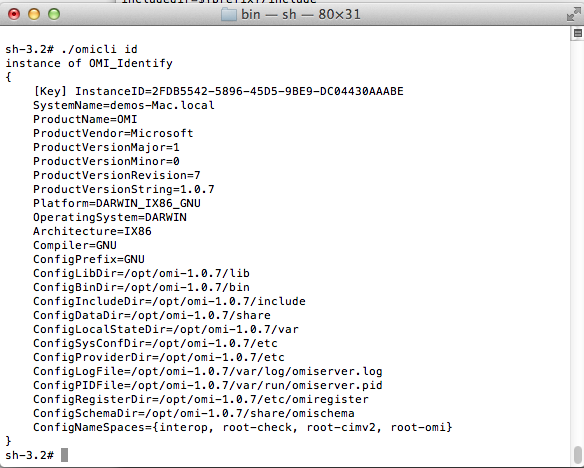 To compile OMI on a Mac demands some changes in some of the source files of the OMI package. At this point I would like to give credit due to the following post that shows you how to compile OMI for Linux: Managing Linux via OMI: Installation. 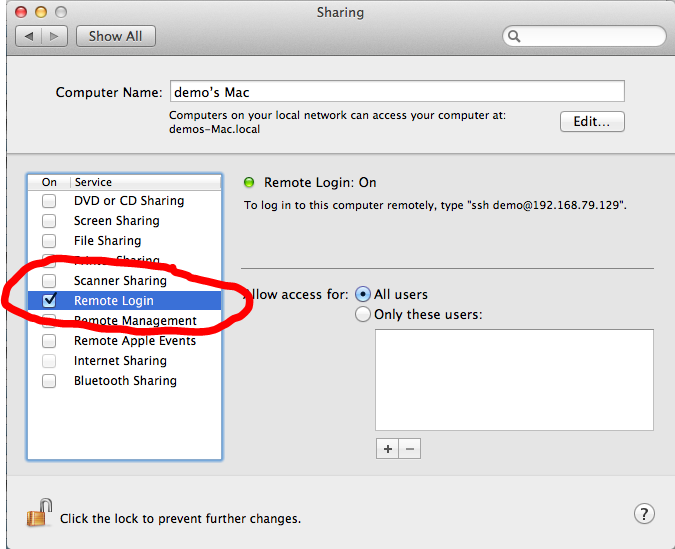 Before you change the settings on your Mac shown in this blog, please be aware that this might pose a security risk so I would advise against doing this on a production system. Ok Lets get started. The first thing we need to do is make sure we are working with the latest version of OSX. 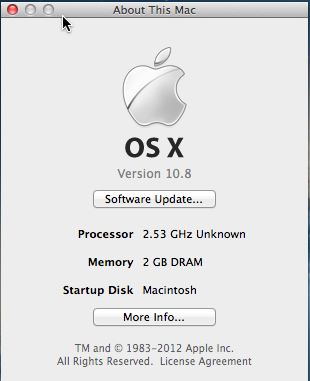 The version that we will be using is OS X 10.8 Mountain Lion. Next we need to install Xcode (free of charge). 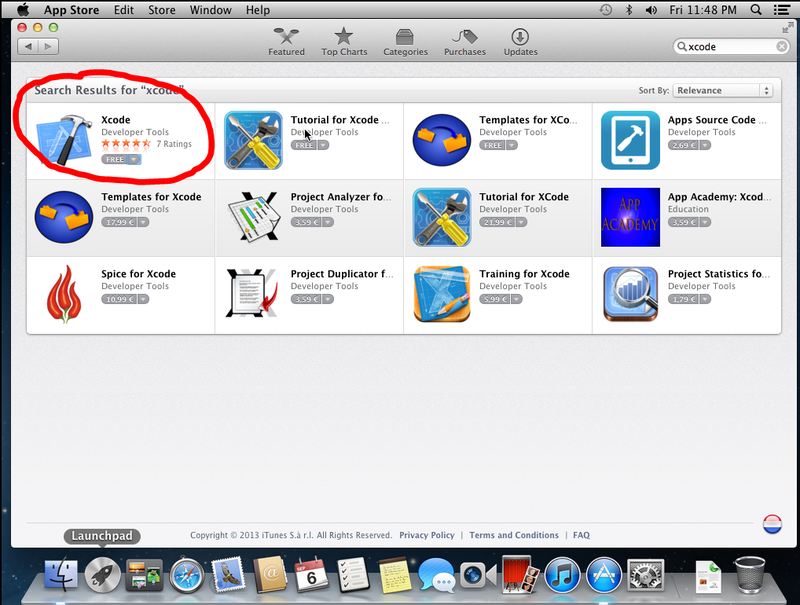 Login to the App Store with your Apple ID and install Xcode. In Xcode we need to change a settings before we can edit/compile/install the omi package. From the menu click Preferences and then the Downloads button. We need to add the Command Line Tools. Your Mac does not allow you to edit source code downloaded form the internet by default. 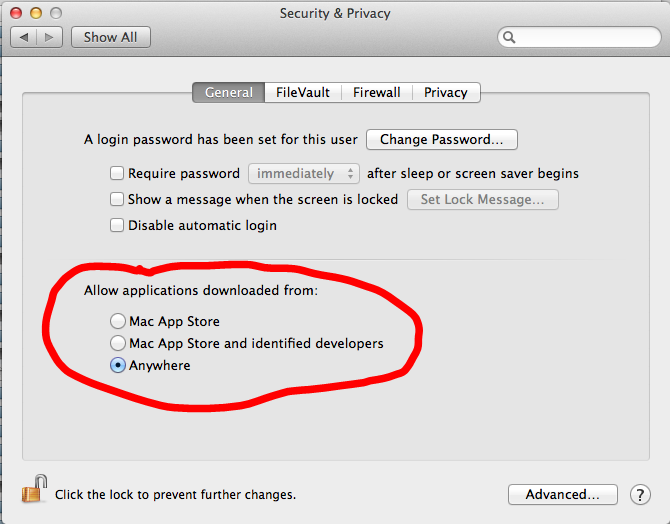 To change this we must browse to System Preferences -> Security & Privacy and change the Allow applications downloaded from: setting to Anywhere. We also want to be able to login with SSH, so we enable this System Preferences -> Sharing and checking the Remote Login check box. Choose Apple menu -> System Preferences, and then click Users & Groups. In the Network Account Server section, click Join or Edit. Click the lock icon to unlock it, and then enter your administrator name and password. Choose Edit -> Enable Root User, and then enter a root user password in the Password and Verify fields. 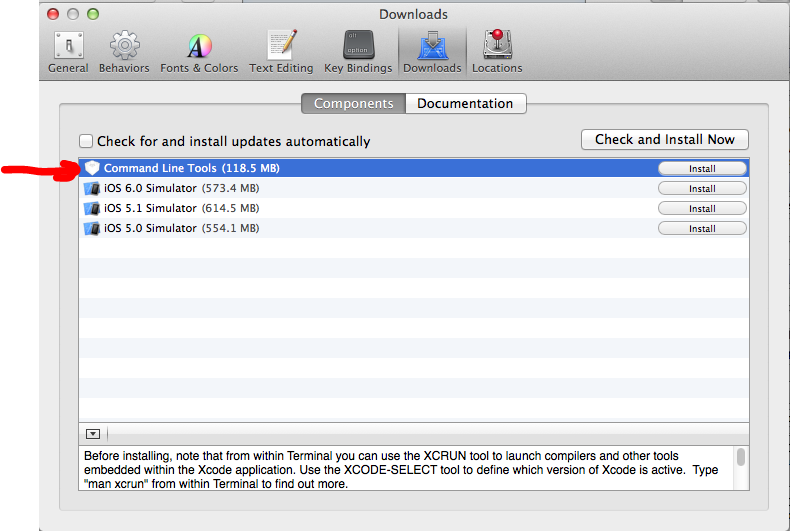 Your Mac should now be ready to compile, configure, and install the OMI package as shown in part 2. 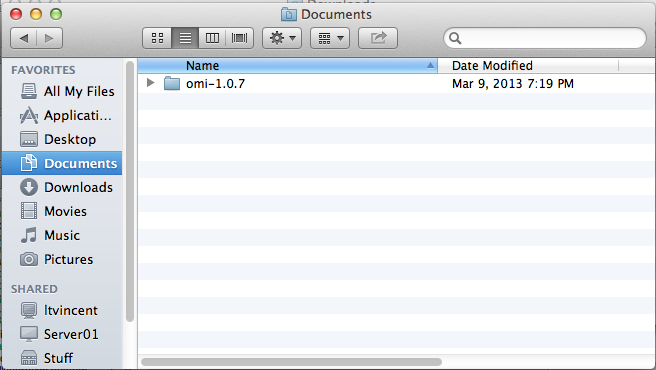 This is the first part of creating a management pack for the latest version of Apple’s OS X (10.8) Mountain Lion. This post will show you how to compile the new OMI agent (Open Management Infrastructure), set up communication with the agent through Powershell and finally create a Management Pack to communicate with the OMI agent.